White lipstick was a popular lipcolor in the 1960s. 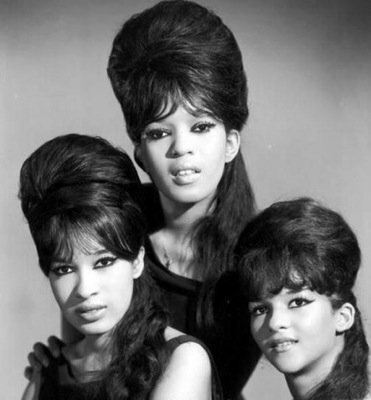 American girl groups, like the Ronettes and the Shirelles, popularized the color. Many young women applied white over pink lipstick, which would make their lips a very pale pink. Like black lipstick, white can be an outrageous shade for your lips. Unlike black lipstick, white does not stain, unless it's very poorly made. It can also be subtle enough for the office when properly applied. "White Lipstick" was the original title for John Waters's 1988 film Hairspray; it was also the subtitle for "Hairspray 2," which has since been put off. In the original film, Ricki Lake (the protagonist) wears pink and white lipsticks with her hair up in a bouffant. To this day, this lipstick color still carries a heady association with 1960s bubblegum pop. In the 1960s, lipstick chemistry was not as advanced as it is now, so most lipstick (white, pink, red or otherwise) was matte, sheer or slightly shiny. Today, the explosion of liquid and cream eyeliners has led some girls to apply white eyeshadow to their lips, resulting in a strange (and sometimes unsanitary) look. White has also been a popular lipcolor in the punk and goth scenes, though it's never been a huge seller. Manic Panic sells a white shade of lipstick (see below) along with their other punky hair colors and cosmetics. In the early 2000s, this lipstick became all the rage with ganguro girls (顔黒) in Japan. The ganguro look is a photographic negative of the goth aesthetic: tanned skin, white eyes and white lips, plus contacts and long, pink nails. Instead of emphasizing doom and gloom, ganguro girls aimed to be cute, peppy and fun. 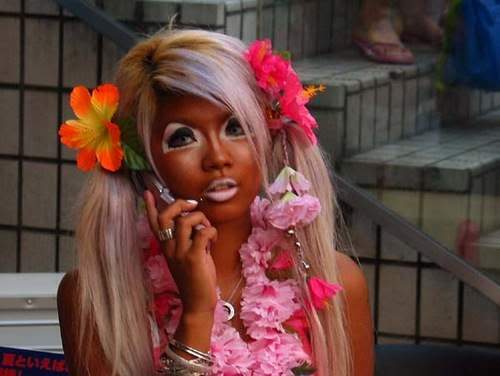 In life, just like in the Japanese language, there is a fine line between kawaii and kowaii, and the ganguro aesthetic is liable to frighten small children. Remember this aesthetic, if nothing else as a cautionary tale, or maybe even an inspiration. L.A. Colors sells Angel White lipstick for $3.60. Despite the low price tag, the lipstick gets good reviews. Manic Panic sells a white, opalescent lipstick––a very gothic shade. It's only $10.80 from their website. The blue tone is more pronounced than it seems, which might be offputting if that's not what you're going for. OCC's Lip Tar, a lipstick/lip-gloss hybrid, comes in both pure white and pure black, as well as other unusual colors like yellow, cyan blue and forest green. They cost $12.50 and are frequently raved about in beauty blogs. Lip tars are somewhat shinier than the other lipsticks on this list, due to their combo gloss/lipstick formula. If you're looking for something even cheaper, check out RacheShop's white lipstick. It's only €3.99, though it ships from Germany, which means it will cost about the same as Uemura's lipstick to ship to the US. It's less for EU customers, though. MAC Cosmetics also sells a "shimmery warm white" lipstick called "Bubbles." Bubbles is available on Amazon.com .